Comic book and graphic novel publisher Zenescope Entertainment is excited to announce that Grimm Fairy Tales, the company’s flagship series, returns this December. Skye Mathers is brand new on the job, still trying to figure out the ins and outs. Her mentor isn’t much help, as all he can do to answer her questions is tell her that it’s sort of a learn as you go gig. On the plus side, Skye gets to travel to interesting places, meet unique and interesting people, and on occasion kill them. It would all be right there in the job description, if the position of Guardian of the Nexus had a “job description”. Our world is the Nexus of the four Realms of Power: Wonderland, Oz, Neverland, and Myst. The denizens of those realms are known as Highborn, and every now and then, the Highborn get a little rambunctious and make their way here to Earth. Whenever the realms mingle, bad things tend to happen and one individual is chosen to stand in the way. The previous Guardian, Skye’s mother Sela, sacrificed her life in battle to ensure the continued spinning of our globe, placing Skye right in the middle of an ongoing struggle. For the relaunch of Zenescope’s longest running series, that struggle takes Skye to Western Indiana, where a young college student named Tina is having problems with a stalker. That might not seem like a ground-breaking story for a comic book… I mean, all Tina needs to do is give a description to the police, and the stalking dirtbag gets shuffled off to dog her footsteps no more. Right? Now we get to the catch: Tina’s being stalked by a werewolf. So far, she hasn’t been harmed, however the local livestock isn’t faring nearly as well. When Skye arrives on the scene, she meets the local sheriff as he investigates the death of the latest casualty, one very unfortunate cow. He seems nonchalant about the whole thing… the sheriff, not the cow… and as far as he’s concerned the whole thing is just a case of college fraternity shenanigans. Meanwhile, Tina is trying to find someone to talk to about her stalker problem, but with said problem being an eight-foot-tall werewolf, it’s a little tough to get anybody to listen. Even a potential would-be suitor, Paul, is a little reluctant to admit to the validity of her story. The only bright side in Tina’s case is that she hasn’t been physically attacked yet. Through all of this, Skye is doing her best to make sure that Tina doesn’t end up like that poor cow, all while trying to get the hang of her new-found abilities. Zenescope Entertainment, founded by Joe Brusha and Ralph Tedesco in 2005, has made their niche’ in comics by adapting well known fairy tales and fables into a modern and much more adult format. They started with their flagship book, Grimm Fairy Tales, and with this issue they’re relaunching the title with the stated idea of bringing it back to the basics. By running each issue as a standalone story, the relaunch would be very new-reader-friendly, and create an excellent jumping on point for anyone interested in trying something a little different. Readers might want to get on that, however, because if the previous iteration of the title is any indication, things are going to get really crazy, really fast. In previous dips into the Grimmverse, I didn’t really find a compelling reason to stick around. The books generally looked really good, but for whatever reason the stories didn’t seem to click with me. Lately, however, the writing has taken off and I’m finding myself looking forward more and more to each new installment. It isn’t just about the scantily clad heroines and villainesses, although admittedly they are still there, but more about the character interactions. One thing I did find in this issue was that it got a little tough to keep some characters straight… In what amounts to a murder mystery, the big reveal had me flipping back to see who was who. Some of the character designs were a little indistinct, and in the case of the sheriff not totally consistent (hint, the sheriff wears a hat, and his deputy doesn’t…). I’m very happy to report that Zenescope has hit a stride. 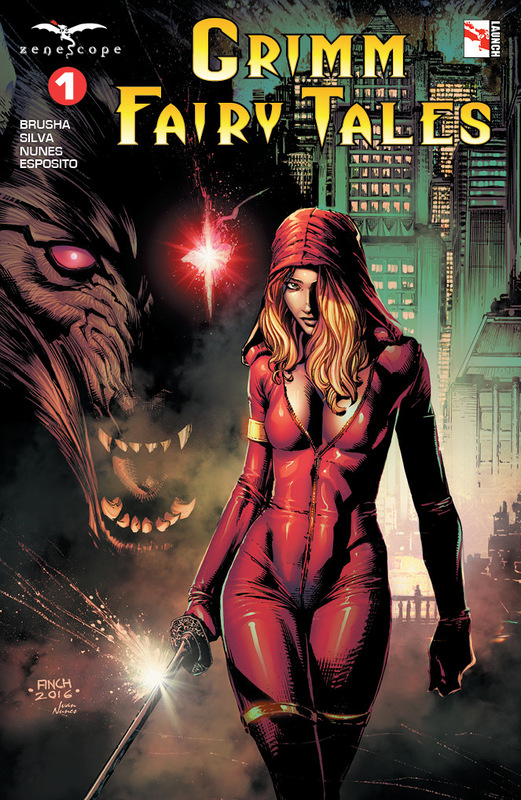 In some of my more recent reviews, for titles like Robyn Hood and Grimm Fairy Tales: Apocalypse, I’ve made comparisons to Buffy the Vampire Slayer. If you’ve never watched that show, I would have to encourage you to ignore the ridiculousness of the title and give it a try. Joss Whedon was mastering the art of snappy dialogue and witty banter between interesting and diverse characters way before it was cool, and I see a lot of that in Zenescope’s current titles. What’s more, the lack of “superheroes” adds a different flavor to the mix, focusing on magic and monsters instead of mutants and radioactive spiders. The overall effect might not be a huge departure for comic book readers, but in my occasionally humble opinion it makes Zenescope’s menagerie stand out from the crowd. 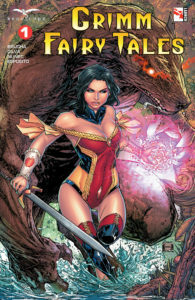 My bottom line on this, and other titles from Zenescope, is this: If we’re going to work on the premise that reading comic books should be fun, then Grimm Fairy Tales should be on the list of books to take a good look at. Brusha’s approach to Skye and her powers is an interesting one, as she’s pretty much learning about her abilities right along with us. To sweeten the pot, the second issue is promising to take us from werewolves right into a battle against the Snow Queen, so it really does look like anything goes!